With Thanksgiving approaching, you may be scrambling to find some wines to go with everything you serve. As I’ve said before, there’s no one wine that will pair with everything you serve, and more importantly, drink what you like on Thanksgiving. That being said, if you rather focus on your family, friends and the meal itself, you can leave the wine selections to me. I’ll offer two more options that I recently tasted as part of a sample review from Frederick Wildman’s various offerings. I’ll also point you to some wines I’ve recommended in the past, because they’re tried and true. I’ve always thought that Riesling is a great grape for the holidays. 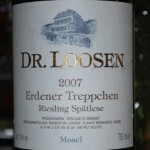 I mentioned a few different producers in the past, though I do always think that a Dr Loosen wine makes a great showing. From the $12 Dr Loosen Dr L to the $25 Dr Loosen Erdener Treppchen, they offer great flavors alone, or paired with food. I’ve enjoyed them with ham or other pork dishes, as well as poultry. Many of my family members love the easy drinking, fruit forwardness of the Dr L, especially with it’s crisp, clean finish. It always makes an appearance on our holiday table. 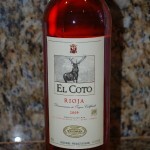 If you are looking for an easy drinking “welcome” wine, look no further than El Coto Rioja Rosado 2009. This rose is a blend of 50% Tempranillo and 50% Garnacha, and is 100% great. With a fresh fruity nose of bright, brilliant strawberries, this $12 wine will be greatly appreciated by your guests as they settle in for the day. The nose carries through to the palate, with fresh strawberries and raspberries and mild acitity, making this wine a fun, light to medium bodied wine to sip on, or pair with appetizers and cheese. 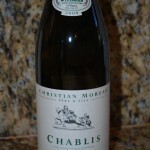 Another interesting wine sample from Frederick Wildman was the Domaine Christian Moreau 2008 Chablis, which retails for about $24. I love Chablis for it’s crisp, pure expression of Chardonnay, and the opportunity to have my “I hate Chardonnay” friends eat those words, or swallow them. There’s a crisp, steely nose with apple laced scents, which is followed by a medium bodied crisp palate of tart apple. There’s a bit of a citrus note, attributed to the firm acidity, but it’s a nice refreshing wine. This wine will certainly drink well with any fish or poultry dishes on your holiday table. If you’re a fan of red wines, don’t forget a bottle of Pinot Noir. Whether it’s from California, Oregon, or Burgundy, a glass of Pinot Noir will go well with much of your holiday fare. It can be light enough to pair with your turkey, and full bodied enough to pair with any beef dishes. 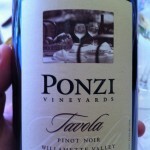 We had a bottle of Oregon’s Ponzi 2008 Tavola Pinot Noir with lunch last week, and it immediately made my “Thanksgiving Wine” recommendation list. Great fruit mixed with an earthy smokiness that everyone at the table enjoyed. It paired with everything from croque monsieur to a french dip to a salad with grilled chicken. We’ll probably be serving a bottle of J Christopher Pinot Noir, also from Oregon, and a bottle of Hahn Estate SLH Pinot Noir, since we have them both stocked in our cellar. By no means should you reserve these wines for holidays alone. 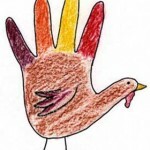 And of course, this is not a definitive list of wines you can serve on Thanksgiving. Make a statement with dessert wines, whether a Sauternes or a Port. They will satisfy your sweet tooth without making you feel that you ate more than you should have. I’ll have some recommendations in the next few days, and add them for your sipping pleasure. I’d love to know what you are serving for Thanksgiving! Do you have any annual traditions? Share them in the comments below!